Following a year of insightful and exciting conferences spread across Central Eastern Europe, we continue our mission to bring excellence in architecture with Belgrade. Come meet us for an amazing day of interactive talks, insightful presentations, workshops, and memorable debates on the hottest topics in architecture. This year's 2nd edition of SHARE Belgrade will take place at the Yugoslav Film Archive Museum and it aims to put together an elite panel of international speakers from countries like The Netherlands, Italy, Bulgaria, Austria, Serbia, UK, Poland, and Romania. A widespread community of senior architects, urban planners, constructors, and designers will attend the conference to discuss and debate over a series of interesting topics in architecture and beyond. From their most recently awarded projects to upcoming trends and projections for the future, SHARE Belgrade will be all about building momentum and connecting people through architecture. Arch. Milan DURIC, President of the Union of Architects of Serbia and Mr. Florin Mindrigiu, Event Director and Founder of PRO event Association will open this year’s edition. "Zumtobel Group - Leading global provider of lighting and related services"
SHARE Belgrade 2019 International Architecture and Engineering Forum is an event organized by PRO event Association in collaboration with the Union of Architects of Serbia. 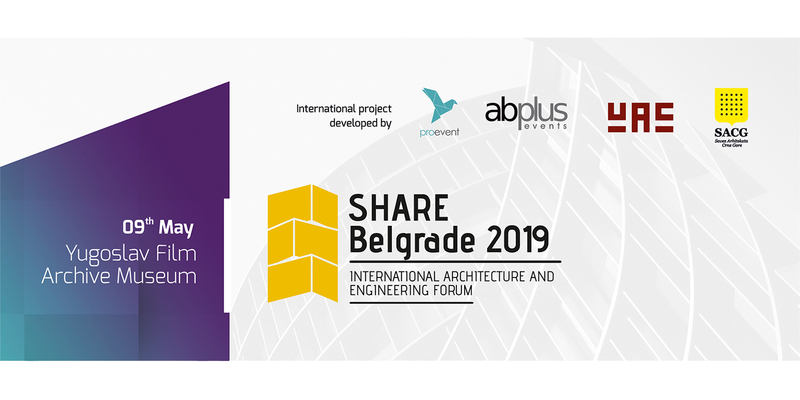 The SHARE FORUM brings together each year hundreds of practicing architects and contractors from Europe, Asia and the United States of America, becoming one of the most important networking platforms for the construction-related fields in Central and Eastern Europe. Its annual editions are a constant relevant presence in Albania, Bulgaria, Greece, Hungary, Latvia, North Macedonia, Poland, Romania, Serbia and Slovenia.